For a complete list of other added features and bug fixes, please see our changelog. Adhering to detailed bibliographic rules is a hefty task that Zotero makes easy by automating the creation of bibliographies and citations. What if, however, you are a multilingual scholar, working with materials in more than one language? There are special challenges here that will soon be met, thanks to the efforts of Zotero community developers who are nearing the final testing phase for Multilingual Zotero, a groundbreaking tool that can automatically capture, organize and correctly format items enriched with translated and transliterated multilingual data. Multilingual Zotero currently exists as an experimental variant of Zotero 2.1 and works in the Firefox browser. It retains Zotero’s original look and feel, but offers additional multilingual functionality, allowing you to translate, transliterate, and sort your citation data within the Zotero application. There is little difference from mainstream Zotero in the big ways. The following screencast by Frank Bennett shows the tool in action, from data retrieval to building a bibliography. A defining feature of Multilingual Zotero is that it can automatically capture citation data in more than one language, if the Web resources in question have multilingual metadata attached to them. Data in two+ languages: By clicking the translator icon in your URL, Multilingual Zotero can automatically pull multilingual data associated with a citation. In this example from the CiNii Web site, Zotero retrieves English and Japanese titles, as well as English name translations from an article. If all the multilingual data you need for a citation record is not automatically imported, you can always add more languages and data manually into Zotero. 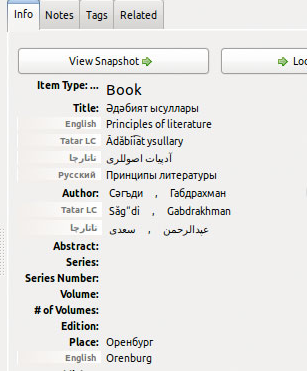 Fields such as Title, Author, and Publication are not only editable but can have multiple language metadata attached to a single element. While the main attraction in Multilingual Zotero is its multilingual features, the same client also provides a duplicates detection and management system, that can be used to identify and merge duplicate items in your library. When items are added to Zotero they are flagged with a yellow highlight that can be removed only by visiting a special “Duplicates view” interface. The end result is the preservation of both document links and collection items. Source: Stephan De Spiegeleire, Tim Sweijs & Tong Zhao, Contours of Conflict in the 21st Century – A Cross-Language Analysis of Arabic, Chinese, English and Russian Perspectives on the Future Nature of Conflict (The Hague: The Hague Centre for Strategic Studies, 2011). Data view provided with permission. What makes Multilingual Zotero extraordinary (in addition to all the other stuff) is that it was created by community members. 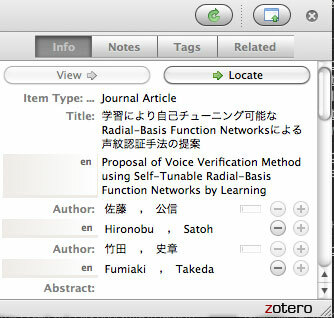 Frank Bennett, Associate Professor at Nagoya University in Japan, prepared the first version of Multilingual Zotero as a contest submission last Fall. Bennett was then joined by Avram Lyon and a range of other contributors from around the globe who signaled their interest in and support for the project through various channels. Frank Bennett’s Multilingual Zotero page (a work in progress) is currently the best source information on the release. In the spirit of “crowdsourcing”, apart from documenting the features of the release, it offers ideas about how scholars can band together and contribute to the curation of multilingual metadata. 1) Multilingual Zotero is currently undergoing major changes and so is aimed at developers only at this time. If you are not comfortable with test-phase software, we recommend that you stick with the current stable Zotero download (v. 2.0.9) for Firefox. Multilingual functionality developed for Multilingual Zotero will be bundled into an official version of the Zotero download in the future. 3) If you develop a Web site that uses the Resource Description Framework (RDF) or another metadata or cataloguing format for storing multilingual data, please add your name and institution to this form. Knowing the kind of sites that are out there, particularly ones that use RDF, will be useful for the multilingual developers. 4) If you want more information on how to make your web site Multilingual Zotero-ready, please direct questions to the Zotero developer list. You are currently browsing the Zotero weblog archives for March, 2011.